Thanks to the good, generous folks at Houghton Mifflin, we had two copies of the exciting new Peterson Field Guide to Birds of North America to give away. There was an easy way and a hard way to win. We already announced the winner for the former. 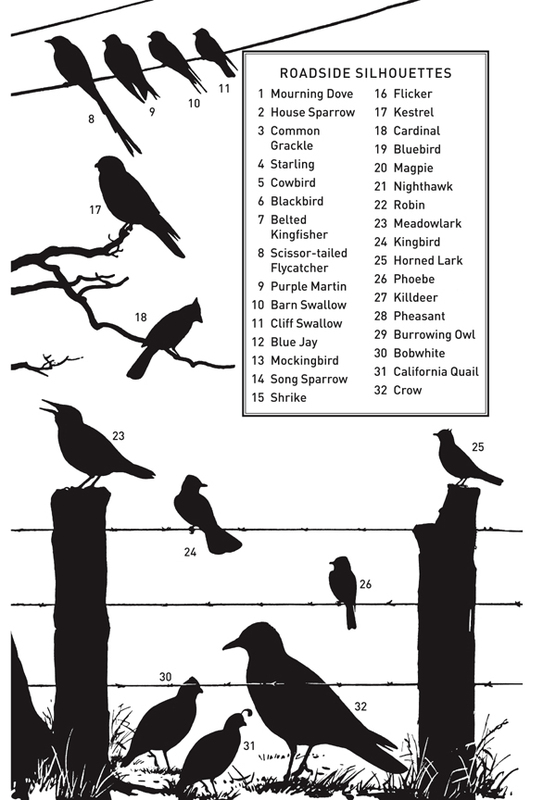 Now let’s talk those canny, courageous souls who chose to do it the hard way, which is to say identify as many of the 32 birds on the Peterson Roadside Silhouette plate. Believe it or not, one participant actually guessed every one accurately. David Ringer, living up to his surname, submitting a flawless list, even going so far as to identify bird #23 as the rare and elusive Lilian’s Meadowlark of the Texas Trans-Pecos region. OK, maybe that last part isn’t true but David did get every single bird right. Well done! However, David chose to participate in a non-competitive capacity, hoping that the Peterson Guide would go to someone whose library may not be as extensive as his. So, Don Mitchell, how is your library? With a magnificent 26 out of 32 birds correct, you have truly earned your free copy of Peterson Field Guide to Birds of North America! Congratulations to you and the rest of our brave bird watching participants. As an interesting aside, certain silhouettes caused greater consternation than the rest. For example, very few people could place the shadows of such common birds as House Sparrow, Song Sparrow, or American Robin! The outlines of Cliff Swallows seem very similar to those of Tree Swallows. Last but not least, many contributors pointed out that California and Gambel’s Quail are virtually indistinguishable in profile. Considering how well you all did with these plates, I believe you. This was a fun challenge, Mike, thanks for the idea! Certainly, the nondescript silhouettes were the challenging ones. However, Peterson’s masterful work generally provides enough clues to make at least a good guess at his intent. The Song Sparrow, for example, shows a long, rounded tail, not the shorter, notched tail of a bunting or a finch, which might also perch atop roadside vegetation and sing. The bluebird is shown in its classic, hunched hunting pose, and the phoebe is wonderfully evocative as well. You can almost imagine its tail wagging. I was temporarily stumped by the cowbird, but then I remembered that they have notched tails, and it made sense that it would be shown next to a larger, longer-billed Red-winged Blackbird. Thanks for dropping by and commenting. You’re right, there are many yummy kinds of bread and things that don’t have HFCS, but not at the regular chain grocery stores. It’s not fair that we have to make a special trip to a “health food” store to find food that won’t kill us! I really don’t know California Quail–who has some hints for distinguishing them on structure? My library was Peterson-deficient, so this will be excellent to have. I had to guess on a few, but I guess that’s what birding is like sometimes… This was a lot of fun. Thanks, Mike and Houghton Mifflin! My answers can stay on my blog, thanks! I am a teacher of immigrants and am preparing lessons on birding that are easy to follow. 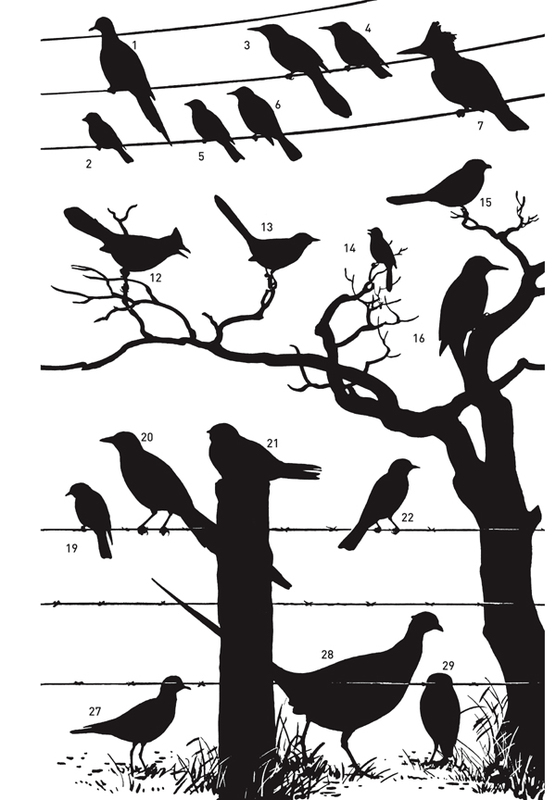 I would like to show them silhouettes for Western birds on our campus like the Peterson’s plates. Do you know of any place I can get a poster-sized version of the platess you have here or others?